Every summer I scramble around trying to find the “perfect” planner. I like a planner with a monthly calendar as well as weekly pages. I like a planner that’s cute and colorful. I like a planner that doesn’t have a bunch of useless stuff in it like maps, time zones, etc. I decided to have a go at making my own planner. I’ve uploaded it to TeachersPayTeachers for only $3. Included is over 100 pages for you to create a planner for yourself. Choose a cover (red, orange, yellow, green, blue, purple, or pink) and print the pages you want. Don’t want the monthly calendars? Print only the weekly pages. 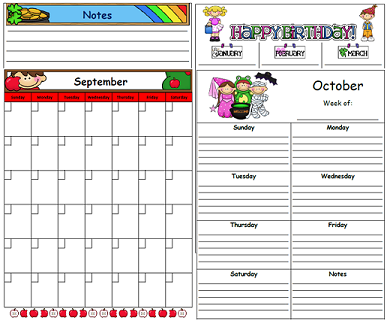 Don’t need the birthday list page or the year long planning pages? Don’t print them! Need more than one notes page each month? Print as many as you need! Choose which month your planner starts! After printing your pages you can either hole punch them and place in a binder or you could spiral bind it. You may even want to consider laminating it and using Vis-a-Vis markers on it so you can reuse it over and over. What a great way to “go green!” This planner is undated so you can use it over and over again! I’m finding it to be very useful so far. I hope someone else out there may find it useful as well. You planner is darling. I always buy one from mixedroleproductions.com. 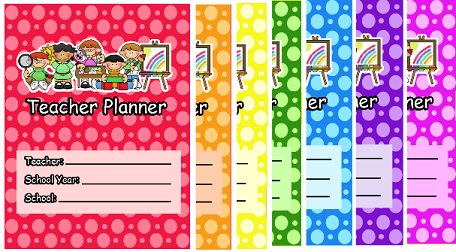 It is an August to August planner (perfect for teachers. Has a monthly calendar and a weekly one. I love them. I gave up the Franklin thing (expensive) for this one at about $15. FYI. I LOVE THIS!!! I will definitely be purchasing this and passing it on to my team so they can purchase theirs too. Thanks for doing what we all have been thinking about. This looks great and it is on my wish list so I can put it all together over the summer. I know every teacher has their own creation of planning pages for their lesson plan book- but does this include “generic” pages for that as well? Sass Class: I have seen those planners before but they never really got me excited for some reason. I know they’re pretty popular though. Mrs. Wilson: The planner is not really a lesson planner. I do not include any lesson plan templates in the file.